Colored Weber Master-Touch Kettles make a splash! …in Canada. Perhaps a sign of things to come for Weber America? 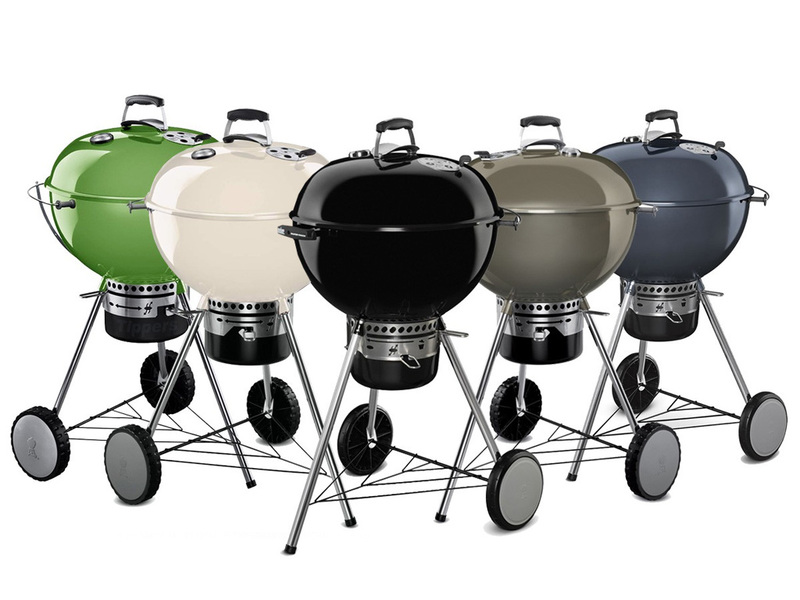 I suppose only time will tell, but the chances of these models eventually showing up in the United States seems all the more likely after Weber Canada launches 4 hot new colors!! Previously only offered overseas, the new Master-Touch colors have been a long awaited addition to the North American lineup. Available now in Spring Green, Ivory, Smoke and Slate – the new models will be hitting store shelves north of the border within mere days of this posting. This news originally surfaced in Eastern Canada (Ontario) and has since been confirmed by Western Canadian distributors to be true! As a Weber fan this is extremely exciting news and hopefully a glimmer of hope that the rest of North America will soon have options other than classic black! Interesting that the ash catchers are different on the black and slate ones. Hopefully we can get some of those colors in the US soon. I would love the slate or ivory. Good eye! However that’s probably my fault on the image 🙂 I would imagine all ash catchers will be the newer style seen on the Black. So if we drive up to Canada nothing could stop us from bringing them back, right? Can we buy stuff and have it shipped from Canada to the States? Do you think there will be Canadian retailers who will make a fortune shipping them to eager US residents? I want that slate one or the ivory or the green, ARGGHHHH, I WANT EM ALL! Not only are the ash catchers different on the black and slate ones but the wheels are smooth while the ivory, green and smoke ones have ridges on them. The image above is not accurate in regards to the wheels. All the wheels are the same smooth recycled rubber, with light tread. Sturdy. Dealers in Canada have taken some delivery and the MT’s are on the floor.. Some Weber Alliance Dealers will ship to the U.S. as well. Thanks Eric! very exciting news! can you list a link to a weber alliance dealer I can buy one from? Where in the US are you? There are Alliance dealers across Canada. I live near the ambassador bridge. Is there a dealer in Windsor?